This recipe is so simple I hesitated to post it. It’s not fancy, or exciting, but I find myself making it so often, on those days when it’s suddenly time for dinner and I haven’t shopped for groceries and I’m hungry… I thought someone else has probably been there too. This simple rice and beans uses canned beans and chiles and long grain rice, all pantry items you can easily keep on hand. And most cooks have onions and garlic in the house – that’s all you need to make a healthy vegetarian meal. Last night was just such a night. 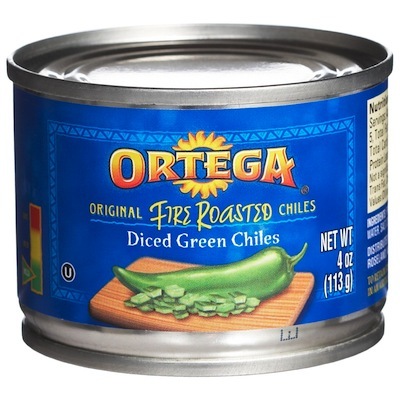 I was starving and wanted something easy and luckily I had canned beans and chiles… I was home free! I love this easy recipe. I didn’t even have chicken stock so I used plain water and it was still good. While it was cooking I had plenty of time to make and eat a big salad. By the way, I tried this rice & beans once with the “hot” chiles – OMG!! Too spicy for me!! My favorite rice for this is Uncle Ben’s and I like Ortega brand fire roasted chiles. I usually find S&W black beans and I never used to rinse them. The rice got dark brown but I didn’t mind since it didn’t affect the taste but since I was taking a picture, I rinsed them and the dish looks much better. This dish is not spicy at all. Don’t be scared off by the “fire-roasted” chiles. I use the mild ones and there is no heat at all. I know this is not a fancy dinner but it’s quick and easy, filled with protein & fiber and it’s economical too. By the way, black beans have the highest antioxidant level of all beans and they also provide the same heart-health benefits as red wine. With black beans you’ll also be getting fiber, calcium, folate, iron, potassium, and protection against cancer, heart disease, and diabetes. 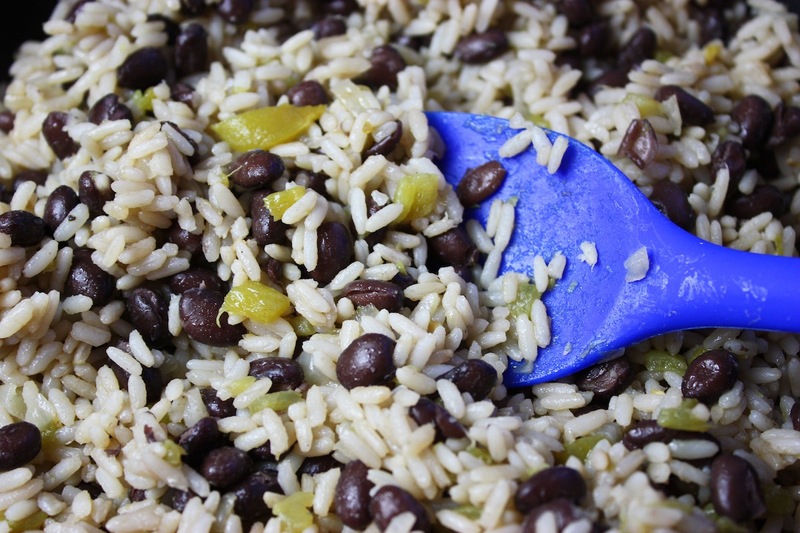 7 Comments on "Fast Rice & Beans"
Do you rinse your rice before using? No, I did not rinse the rice. Jenny, I’ve never bought chiles of any kind as I care not for any spicy heat in my foods. 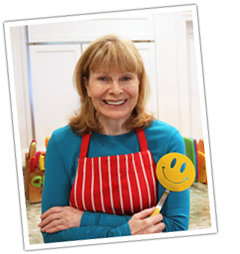 Please tell me I can enjoy this recipe anyhow as I depend on you for your healthful, easy recipes. Thank you dear one. I don’t like spicy foods either but I assure you that the can of mild chile peppers has no heat whatsoever. In fact, I thought this recipe was too bland to even post. Don’t let the term fire-roasted scare you off – that’s just how they’re cooked: roasted on a flame. The peppers add moisture and flavor to this dish but no spicy taste at all. 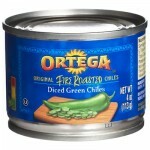 If you can find Ortega brand, you can enjoy this dish with the best flavor and no spicy heat. however, I was married to an Italian & in my youth, I did not cook any of my mom’s dishes at that time and forgot how to. You have made my recent transition back to my roots so much easier for me. Thank you! gravy. Why? Bcos it’s loaded with the dreaded “Sodium”. Even canned fish packed in water is loaded with sodium. It will raise you Blood Pressure thru the roof. enlighten you to the dangers of the sodium liquid in the canned foods. So, please, everyone, always rinse the canned beans, peas, carrots, etc., and dump all sodium rich liquids from all canned foods, which are used as preservatives, down the drain. Items like canned tuna or salmon or sardines can’t be rinsed, but at least you’ve gotten rid of most of the Blood Pressure raising sodium rich liquid. Very thoughtful comments. Thanks for the reminder and cautions. Great recipe, as always. I’ve tried several of your recipes – especially the Artisan breads – and always find them well done. This recipe reminds me that not every meal has to be fancy, exotic, or expensive. Knowing the basics of this meal can always be ‘in the pantry’ and provide me with a wholesome meal for less than $3. Way to go, Jenny!